The oldest private reserve in South Africa, dating back to 1934, Sabi Sand Reserve is in effect a private extension of the vast Kruger National Park. It is also probably represents the greatest cluster of unadulterated safari luxury on the planet, surpassing even the Masai Mara. The (65 000 hectare/ 153 000 acre) patchwork of properties, Sabi Sand consists of a patchwork of about 18 unfenced private private game reserves including world-renowned names such as Londolozi, Exeter, Sabi Sabi, Singita and Ulusaba. It sits right next to the south-western section of the park, sharing an unfenced 50km (31 mile) border and animals wander freely between the two. Many visitors who think they are going to the Kruger (and go home saying they’ve been there) never realize that they’ve actually never set foot in the national park but have spent all their time in the more rarified world of Sabi Sand. MalaMala is technically not part of the reserve, but its land is parcelled between the Sabi Sand and the Kruger. The statistics here are astonishing. 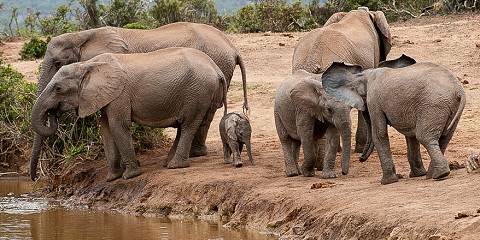 Two rivers – the Sand and the Sabie feed the reserve sustaining one of Africa’s most diverse eco-systems. This is definitely Big Five country but overall there are over 145 species of mammal, 110 reptile species, 30+ amphibian species, 45+ fish species, 500+ bird species – and over 330 different types of tree! Added to which it is owned by people who are passionate about conservation and have the money to back up their passion. The area is thick with game, you will be guided by the best rangers in the business, and the viewing experience will be unsurpassed. Scenically, it isn’t the world’s finest park but much of it is beautiful – a mix of riverine forest, open savannah and mopane bush. It was in the Sabi Sands that I had my first taste of safari de luxe –open jeeps, night drives, expert spotters and my first sighting of a leopard, so it will always have a special place in my heart. Are there any drawbacks to this paradise? Only a couple in my book. One is that this is unashamedly upmarket territory. There are one or two marginally cheaper lodges but if you can’t afford the megabucks, the Sabi Sand isn’t the place for you. Two, it is malarial. Three, in gameviewing terms, it is relatively densely populated so while you will be guaranteed brilliant sightings and a stay of unsurpassed sybaritic luxury, you won’t have the place or the leopard to yourself. But those small technicalities apart, there’s little that you can fault here. Sit back and enjoy the ride. Flanking the unfenced western boundary of the Kruger National Park, the Sabi Sand Game Reserve is Southern Africa’s most exclusive and famous wildlife safari destinations. 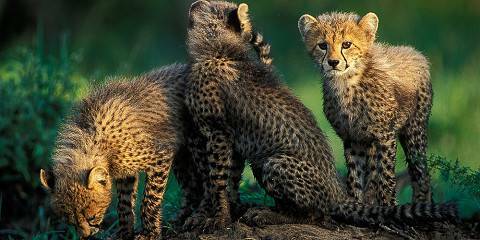 It is also one of the oldest private nature reserves and the birthplace of sustainable wildlife tourism in South Africa. Occupying 70,000 hectares of prime wildlife real estate, Africa’s premier private park is home to a diverse assortment of wildlife, including 145 mammal species and the most consistently reliable Big Five sightings on the continent. While sightings in the southern parts of the reserve can get overcrowded at times, I really like the less touristy northern section with its relatively lower density of lodges and game drive vehicles. But, that said, only the harshest critics of this wildlife wonderland would be heard condemning it as a ‘glorified zoo’. I concede that it’s a commercial machine and the land has been developed to its fullest potential, but the animals remain totally wild – if well-habituated. And the fact that all the wildlife, including its world renowned leopard population, is so relaxed around the open-top vehicles should be considered the ultimate bonus for wildlife enthusiasts who will get to enjoy incredible up-close-and-personal sightings of all the Big Five (and more) in action. The Sabi Sands is magnificent and safari aficionados and budding nature photographers will not want to miss out on a visit to this pricey but highly rewarding private reserve. Sabi Sands delivers the classic safari experience on a plate. It’s a prime chunk of wildlife-watching territory tucked up against the southern section of Kruger National Park, with no fences between the two. This feast doesn’t come cheap, but if your idea of heaven is heading out on a morning bushwalk then, in the afternoon, spending an hour or two watching big cats before retreating to the comfort of one of Africa’s most romantic luxury lodges, I can highly recommend Sabi Sands. The reserve is divided into numerous privately-owned concessions, most of which are aimed firmly at the top of the market and cater for people who prefer the idea of staying in a comfortable lodge rather than sleeping under canvas. The best (and priciest) include Exeter, Lion Sands, Londolozi and Sabi Sabi, which have cool, contemporary accommodation, and MalaMala and Singita, whose lodges have a more traditional feel. Watered by the Sand and Sabie rivers, the woodlands and grasslands of Sabi Sands include some of the very best places to see leopards in the continent. I’ve had some superb sightings here. The resident cats have never been unduly hassled by vehicles and are therefore pretty relaxed. There are strict rules limiting the number of vehicles attending each sighting, and while some feel that off-road driving should be controlled too, I’ve found the reserve’s drivers, trackers and guides to be highly responsible. The only downside is that in areas covered by vehicles from several lodges, you may sometimes have less time than you’d like at each sighting, in order to give other vehicles a chance. The drivers are all in constant radio contact. To have acres of pristine wilderness more or less to yourself, you’ll need to opt for one of the ultra-expensive options such as those mentioned above. A cluster of small jointly managed private reserves bordering the immense Kruger Park, Sabi Sands is arguably the best place anywhere in Africa for certain sighting of all the Big Five – lion, leopard, elephant, rhino and buffalo – in the space of a 2 or 3 night stay. Indeed there is probably no better place in Africa for close-up vies of leopard behavior and interaction. Sabi Sands offers a top-notch guided safari experience, as all game drives are conducted by professional guides working for the various camps in the private reserves. Night drives and guided walks are also on offer at most camps. The one downside, at least for those reserves that share traversing rights, is that guides tend to use the radio rather than innate tracking skills to locate wildlife, so that queues of expectant vehicles can end up waiting for their for one sighting (a maximum of three vehicles per sighting is allowed), which can start to feel a bit contrived, especially when you are asked to move on mid-sighting to make way for the next vehicle. Still, for first time-safarigoers, it is a small price to pay for the near certainly of seeing the Big Five (along with the likes of cheetah and African wild dog), and the animals – which move freely between here and Kruger – remain truly wild. 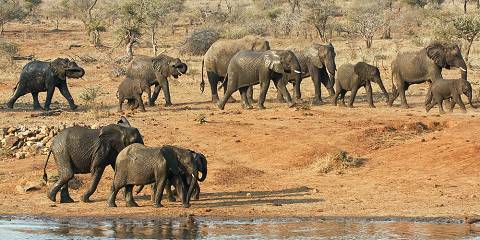 Sabi Sands is one of the best places in Africa to see the famous Big Five: lion, leopard, elephant, rhino and buffalo. Sabi Sands consists of a cluster of private Game reserves that are more or less run in the same way. Each one of these reserves offers you a full inclusive package which consists of 2 game drives and all meals. Some even include drinks. Game drives are conducted in open safari vehicles and most guides in Sabi Sands are very knowledgeable and capable. For people, who would like some exciting wildlife encounters on a short safari, Sabi Sands is the right place to come. Personally I find the whole Big Five hype slightly annoying. All the guides work with car radios and a lot of game drives consists of chasing from one good sighting (picked up by radio), to another. Luckily there are strict regulations about how many vehicles are allowed to approach any given animal, but this results in vehicles cueing for particular sightings. To give everybody a chance to get to any of these good sightings, the time you are allowed to spend on any particular sighting is regulated as well. In Sabi Sands, all predators and other high profile animals are very habituated which makes for some exceptionally good sightings on a par with what you get to see on wildlife documentaries. My highlight must be the fantastic leopard sightings. You won’t see anything like that anywhere else. 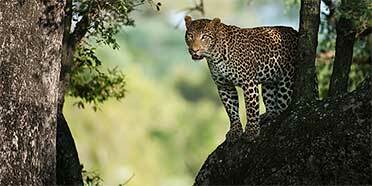 The leopards are extremely relaxed and the guides are experts in following them through the bush. Sabi Sands Private Game Reserve is probably the best place in Africa to see leopard. The guides know the individual leopards and their territories, and I have never been here and not seen at least one leopard a day. Sabi Sands is a classic Big 5 game reserve, and an ideal location for your first ever safari. There are a variety of lodges, all offering the same wildlife experience but varying in degrees of luxury (my first experience of being offered a “pillow menu”!). The reason I’ve not scored Sabi Sands a 5, is because the reserve is not particularly scenic – thick bush rather than open vistas, which can make photography tricky. It is also perpetually popular, so you may have to wait in line for some wildlife sightings – although these are strictly controlled, with only 3 vehicles at a time actually allowed at each sighting. Sabi Sands delivers!